Marvin Siegel opened Tri-Mar in Brooklyn over 25 years ago, manufacturing custom made stretcher bars for professional artists. 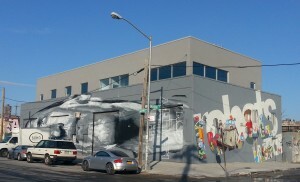 In 1996, he saw the demand for unique high quality artist supplies and expanded his business and opened Soho Art Materials in the East Village. As the business continued to evolve, Marvin launched a new product, the Ultra-Stretcher. Anticipating the new product line and demand, Marvin knew he was running out of space at his factory. Two years ago, Marvin came to Evergreen for help with his business expansion. He knew he needed to build a second floor but wasn’t sure if the zoning allowed it. Evergreen was eager to help. We contacted the city to find out what his buildable square footage was and got all the answers he needed to get started on his expansion plan. Evergreen continued to assist by helping him apply for incentive programs like the Industrial Commercial Assistance Program (ICAP) and the Energy Cost Savings Program (ECSP). Marvin has finally completed his expansion and has a new state of the art building that will help him expand his business and grow community jobs. For more information on incentive programs please contact Karen Nieves at 718-388-7287 ext 160 or knieves@evergreenexchange.org. Want to learn more about Tri-Mar/Soho Art Materials? Please visit trimarstretchers.net and www.sohoartmaterials.com.